Refer to the ‘York Circle’ in the company of present-day steam railway enthusiasts, and they will think you are talking of the York - Harrogate - Leeds - York line. There is however, another circular route based on York, and on Saturday 5 April this line was to see a ‘special’ headed by 46229 ‘Duchess of Hamilton’. The line I am referring to is the York - Hull - Scarborough - York route, and I had an enjoyable time on that Saturday chasing the Duchess. I was in fact staying in York the whole of the previous week, and had in my possession one of the infamous ‘Persil’ vouchers. Thinking of the forthcoming special, I realised that I had not travelled over the greater part of its route. On Wednesday 3rd April I duly presented myself, with wife and family in tow, at York booking office. I ought to say ‘Travel Centre’, as the concourse area now contains a most impressive new facility for the rail traveller. Centre - piece of the entrance hall is a former North Eastern Railway slotted post signal, in a purely decorative role. It last saw service, appropriately enough, on the Scarborough line, near Haxby, and was still earning its keep last summer. To do the circular tour, the booking clerk suggested I booked a ticket to Bridlington which would be available via either Hull or Scarborough. On studying the timetable, it was clear this would be a useful point to break the journey for lunch, so we obtained our tickets and made our way to the bay platform where the 1030 train for Hull stood. I had expected a DMU, to my pleasant surprise there stood four MkIIs (the older variety) and class 31 No 446, looking somewhat oily and world weary. We would have about 18 minutes to make our connection at Hull, so it was with growing concern that we sat in the train, in the bay platform, as the minutes after 1030 passed by. I assume the cause of the problem was a late running HST from Edinburgh which duly arrived, and departed, followed after a very brief interval by our own train, which was to follow in the HST’s footsteps for the first 16 miles or so. I guessed that was why we were held, quite apart from any connections that should have been made, as the HST would soon have caught 31446 on the brand new stretch to Hambleton Junction. The route we were to take today would be somewhat different to that taken by York - Hull trains 20 years ago. Trains then left York on the Scarborough line, forking to the right at Bootham Junction and travelling via Market Weighton and Beverley. I can remember studying the BR timetable a few years ago and seeing that the York - Hull service was shown as a bus service. Through trains after 1965 became impracticable as a reversal at Selby would be required. Today, however, with the former main line now closed and lifted between Chaloner’s Whin Junction and Selby - trains enter Selby from the south, travelling then across the swing bridge and out across the flat lands to Hull. 31 446 growled out of the bay platform, and quickly accelerated (it was only a four coach train) past the defunct hump at the south yard, and the even more defunct former London line at Chaloner’s Whin. The new Junction at Colton was taken with scarcely a jolt, and we ran quickly down the new line. A unique experience for me, it was rather like driving down the motorway in a BR MkII, with all the brand new concrete bridges and clean lineside (verge?). We soon slowed for the junction at Hambleton, where the 1834 Leeds and Selby line crosses above the new line. This was to be our route to Selby, where we paused briefly before departing over the swing bridge. Shortly after passing the site of the former Barlby Junction, we enter the stretch of track which is probably quite well known to SRS Christmas quiz enthusiasts - the 18 mile long dead straight stretch to Brough, where the line swings gently round the southern end of the Yorkshire Wolds, hard against the banks of the Humber. The line passes through a number of stations which happily remain open, though our train, being I suppose an express (!) stopped at none of them. Wressle, Howden, Eastrington stations passed, then Gilberdyke, junction for the threatened line to Goole. Broomfleet and Brough followed, then Ferriby and Hessle, situated close by the new Humber road bridge. We are practically into Hull now, swinging round the reverse curve, past Botanic Gardens depot, and into Paragon Station. Paragon is a station that really looks like a station, with a fine arched iron roof and numerous platforms - too many, if one considers Hull’s somewhat reduced role today. A large poster stated that the station was benefiting from an EEC regional fund grant, for renovation I hoped. Unfortunately I did not have time to study the station more closely. 31 446 had made up a few minutes since leaving York, nevertheless the Bridlington train - a short DMU - was waiting and practically full, so I helped the family find seats, as near the front as possible, then quickly took a few photographs before joining the train myself. The line between Hull and Scarborough, 53¼ miles distant, sees three basic services. The main service is the full line, augmented by Hull - Bridlington and Hull - Beverley trains. Additionally, during the summer months a number of trains run to "Brid" originating from the West Riding and North Derbyshire. In years gone by, the latter trains would have run by the more direct route from Selby via Market Weighton, crossing the Wolds on Enthorpe bank and joining the present route at Driffield. Market Weighton was until the mid-sixties a notable railway crossroads, now the nearest railway is many miles distant. Our train departed on time, swinging to the north over the junctions at Botanic Gardens. First stop is Cottingham, then Beverley, which is one of several former York and North Midland Railway stations to retain its attractive overall roof, in pretty good condition too. Many passengers left the train here, and we were able to gain the front seats and the driver’s eye view. Next stop for the DMU was the small well - kept station at Arram, then Hutton Cranswick, before Driffield, where we crossed a southbound service. (Not that we had to cross it there - the line is double track to Bridlington.) We paused briefly at Nafferton, before arriving at Bridlington, where the train swung across to the right and into a bay Platform. Bridlington station was a pleasant surprise. I had expected something much more basic. While three former through platforms on the western side of the station are disused with their track lifted, five remain in use or useable. The through platforms are 4 & 5, 4 being the eastern face of a former island. 6 is the bay our train pulled up in, 7 & 8 are relatively modern and rather bare excursion platforms. The rails here bore a light film of rust; I imagine they would see use during the summer months. The station buildings are generally unspoilt and well-kept in the live" part of the station. A fine canopy with clean, recently painted ironwork covers platform 5/6, and a very attractive entrance hall remains in use, complete with original booking office and wooden stalls at the windows. An ancient brass model of an even more ancient locomotive turned its wheels and motion for 5 minutes when I inserted a penny at my small son’s insistence. The proceeds were to go to railway charities - the children’s home, I seem to recollect. A pint and a butty would have been the ideal refreshments at this stage in the proceedings, however, with the family in tow fish and chips were the next best alternative. After surveying the scene for a few minutes, we picked the well - patronised chip stop with "restaurant upstairs". It turned out to be the archetypal seaside Chip shop, with tea, bread and butter and a vinyl tablecloth, and a superb piece of haddock. (Cod was always reckoned to be slightly inferior to haddock in these parts). I always feel that fish eaten at the seaside, especially where an inshore fleet remains active, is far superior to anything available further inland. This was no exception, and would knock spots off anything you could buy in Shropshire. (It’s too far from the sea) I hope there are no fish-frying members of the SRS - if there are, my humble apologies, I obviously haven’t tried! After an hour or so on the rain-washed beach (the kids didn’t seem to mind) and 50p’s worth of penny amusements (re-living my childhood in those same halls) we made our way back to the station, to catch the 1522 for Scarborough. We would not in fact travel as far as the latter place, northbound trains from Brid mostly being timed to connect with Scarborough - York trains at Seamer, about 5 miles out from Scarborough. The 1522 rumbled into platform 4 at the appointed hour, and duly departed. Once again, we managed to get seats at the front extreme of the train, with the view ahead. The train traversed the level crossing by the end of the station approach road, and entered both the single-track section to Hunmanby and the notorious Bempton bank. The gradient is not as severe as the banks on the now lifted stretch of line a few miles to the north, between Scarborough and Whitby. There, ex-NER tank locos used to struggle up gradients steeper than the Lickey with four or five coach trains, unaided. Our DMU struggled up a bank which is probably no steeper than 1 in 150. Nevertheless, I would think it caused problems in steam days, when the east wind lifted a soggy mist from the sea - a "sea fret" as it would be known in these parts. 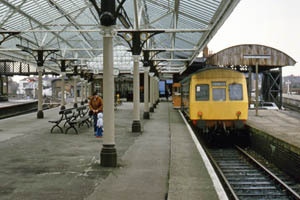 Filey proper is another of the Y&NMR overall roofed stations, still intact though in less than first class condition. Back to single track again for the 7 miles to Seamer, where we arrived on time at 1557. Unsuspecting we detrained to await our connection with the 1557 Scarborough - Liverpool Lime Street, due into Seamer at 1603. Obviously, had all been well, we would have passed the York train had we stayed on the DM11 to Scarborough. All was not well, however, as became clear about 6 minutes later when the York train failed to arrive. It was at this point that the solitary member of the station staff announced to the 20 or so people waiting that the train was unlikely to arrive for some considerable time, as it had not yet passed through Seamer on its way to Scarborough. Failure had occurred somewhere between Malton and Seamer. It appeared from the timetable that a Scarborough - York train would materialise in about 4 minutes, so we resigned ourselves to a fairly long wait. Fairly long? The true nature of BR’s problems now became clear. On enquiring of the furtive and elusive BR chappie (I’m not sure what his correct title would be) as to the likelihood of the train materialising, I was informed that it was unfortunately stuck behind the failed Liverpool – Scarborough. Seamer station is a pleasant enough spot, an island platform with a canopy and small waiting room, all in well-kept condition. Painters’ scaffolds and boards indicated that redecoration was in progress, though there was no sign of the painters. However, on a rainy early April afternoon, with a chilly wind off the sea, it was clearly not the beat of places to spend hours waiting for trains that might or might or might not arrive! The reader may have realised by now, as we had, that we should have stayed on our DMU into Scarborough, where we would have been better informed, and could have obtained refreshments or wandered into the town. I’m not entirely blaming the poor BR man at Seamer - he appeared to give the luckless inhabitants of Seamer station as much information as he had, which is not saying much. It never seemed to occur to him, however, what a gross dis-service he had done by allowing York passengers to get off the DMU! At about 4.30, a Hull-bound DMU rolled into the station. Then about half an hour later our spirits rose when a north-bound train was signalled. Another DMU from the Hull line, no use at all. Seamer Junction, I should add, is about half a mile south of the station and round a gentle curve, so that the actual junction signals etc are not visible from the station. Not long after the latter train, the signal was pulled off again, and after a long pause, the sound of a loco-hauled train could be heard. Eventually, the delinquent Liverpool - Scarborough drifted round the curve, with a ‘Peak’ at the head and a 31 pushing from behind. After a brief pause, the heavy train slowly and laboriously rumbled out and up the gradient towards Scarborough, with the 31 apparently doing most of the work, the 45 blowing out some exhaust as a token gesture. This train had hardly cleared the station when the signal cleared again, and shortly the baulked York - Scarborough arrived, a rake of four or five MKIs, headed by no less than 31446 again This train was in fact the next to leave Scarborough after a rapid turn-round, and we thankfully climbed in when it arrived at Seamer. There cannot be many MkI corridor coaches left, for that was what we found ourselves in. The train quickly gained speed through the almost perfectly flat vale of Pickering, once a glacial lake, flat and featureless, with little of railway interest until we reached Malton. A branch used to run from Seamer to Pickering, but has been lifted for many years and I could see very little of the former trackbed. A more recent and well- known casualty was the Malton - Whitby line, which closed almost exactly 20 years ago, at the same time as the Scarborough - Whitby line mentioned earlier. Most of the former has of course been preserved in the form of the North York Moors railway. It left our current route at Rillington junction, where the trackbed was still fairly clear. Some interesting relics remain at Malton, the only intermediate stop. A little way out are the remains of the overbridge which used to carry the Pilmoor – Malton - Driffield route. The notorious Malton -Driffield line closed many years ago -1950 - to passenger traffic. The Pilmoor line however, was in use until 1963, mainly for Glasgow - Scarborough trains. This link closed when a derailment destroyed the junction at Pilmoor, which was not reinstated. A double reversal was necessary to get the aforementioned trains to Scarborough, as the connection was west to south. At Malton station our train crossed to the opposite line to stop beneath yet another Y&NMR overall roof. There is only one platform face here, reminiscent of former S&DR stations further north. There was another platform, connected by a drawbridge, but this has long since been removed. The most attractive stretch of the line follows, as the line winds along the twisting Derwent valley, past Kirkham Abbey ruins. Then a short climb takes us out of the valley, through the heather - clad Strensall Common and down, past the Rowntrees factory (still rail-connected, with its own locos) and across the Ouse and into York. I almost missed the Duchess on the following Saturday It had been advertised to run via the Selby Deviation. Five minutes before it was due past Bishops Wood, a fellow gricer leaned out of a passing car window to say that, at the last minute, it had been re-routed via Gascoigne Wood. The small group waiting were somewhat flummoxed What to do? Was it true or just a vicious rumour? Debate ended abruptly when I spotted a trail of steam away to the north-west, obviously on the other line. I leaped into the car and hurtled off to Thorpe Willoughby, near Selby, where I was the only photographer, and got a most acceptable shot. I was to see the train again on Bempton bank, where the sun came out seconds after it passed; at Gristhorpe, just north of Filey, and at Malton - another most enjoyable day on "the other York circle".